Η TechArt παρουσιάζει το νέο πακέτο που ετοίμασε για τις 911 GTS και 911 GTS Cabriolet που θα το παρουσιάσει στην έκθεση της Γενεύης στις αρχές του Μάρτη. Σε αυτό τοποθετεί διπλές κεντρικές απολήξεις εξατμίσεων, αεροτομή, μπροστά spoiler, πλαϊνά skirts, σφυρήλατες ζάντες 20″, carbon διακοσμητικά και σύστημα ανύψωσης που με το πάτημα ενός κουμπιού αυξάνει την απόσταση από το έδαφος κατά 45 mm. Στο εσωτερικό υπάρχουν νέες δερμάτινες επενδύσεις, carbon και αλουμινένια διακοσμητικά όπως και αλουμινένια πεντάλς. OE-quality personalization in terms of aerodynamic styling, driving performance, wheels and bespoke interiors. The TECHART individualization range for the Porsche 911 GTS models does not only comply with the high demands towards technical and functional quality. Its design maintains the typical core values of the series model but places new sporty and personal emphasis on individual details at the same time. The result is a subtle but distinctive difference to the standard models. A new TECHART front spoiler upgrades the series front apron of the GTS models. It creates additional dynamics by lowering the body visually and it reduces the aerodynamic lift at the front axle. 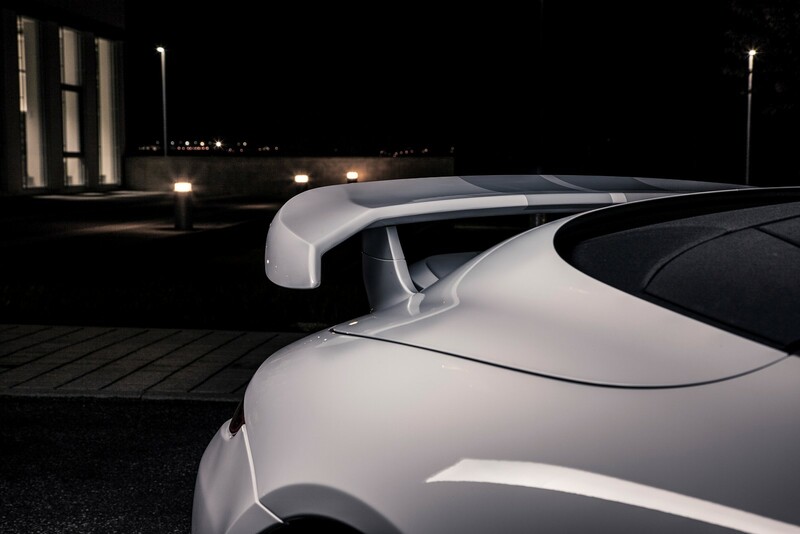 In combination with the elegant roof spoiler, the prominent TECHART rear spoiler and sharp profiled side skirts, the TECHART Aerokit for the 911 Carrera GTS creates both, well-balanced aerodynamics as well as the typical TECHART individualized styling. TECHART exterior trims are customizable in color and finish and even available in carbon fiber. Such as the air outlet at the front of the luggage compartment lid, design trims for headlights and exterior mirrors (for vehicles with electrically folding side mirrors. Alternative TECHART option for the standard SportDesign mirrors: lower trim painted in body color). These styling details help to create an elegant color match or crisp contrasts – just the way individualist drivers like their personal 911 GTS model. TECHART sport exhaust systems add a sporty highlight to the rear of the 911 Carrera GTS and provide a racier soundscape at all speeds. Customers can choose among two different exhaust systems, both of which are dynamically valve-controlled to adjust the sound according to the driving style. 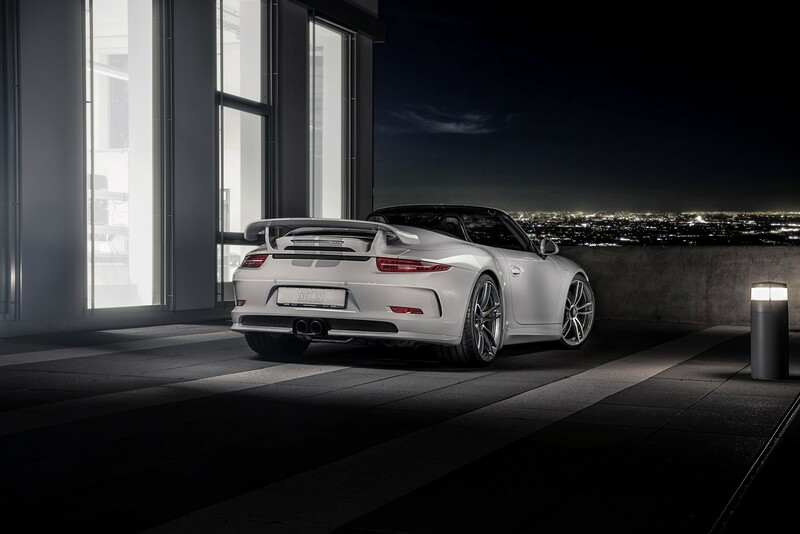 Besides the TECHART sport exhaust system with two twin tailpipes on each side, a second system is available for all Carrera GTS drivers, who are searching for a motorsport-like appearance: this optional TECHART sport exhaust system comes with two central tailpipes and an extraordinary audible presence. For enhanced driving dynamics, TECHART sport springs bring the 911 GTS body closer to the track. But TECHART suspension options can improve its everyday use capabilities, too: the electro-hydraulic TECHART Noselift system provides 45 mm of additional ground clearance at the push of a button by lifting the vehicle’s body at the front axle. The feature can be used at standstill and while driving at low speed. The vehicle is automatically lowered at 60 km/h. Due to its quick operation, TECHART Noselift is perfect to overrun obstacles like garage ramps. The compact design of the system ensures that no space is lost in the luggage compartment. The forged TECHART Formula IV Race centerlock wheel applies the distinctive five twin-spokes wheel design to the GTS models. Capable for track and road, the 20-inch wheel does not only fit the 911 GTS models beautifully, the manufacturing process of the wheel utilizes forging and undercut technologies which results in a particularly low weight. As a matter of course, individualization is a core feature of TECHART wheels, too. Besides the standard bicolor finish in titanium grey with a gloss-turned front surface, the TECHART Formula IV Race centerlock wheel can be ordered in individual color: adjusted to the color of the brake callipers, matching the decorative stitching, lacquered in two or more colors, with a matt finish or featuring a contrasted pinstripe. TECHART’s inhouse saddlery is world-renowned. For the 911 Carrera GTS models, the full spectrum of premium interior design is at the customers’ command. Perfect craftsmanship unifies all TECHART interior enhancements – no matter if the customer prefers selective highlights or a uniquely personalized piece of art. Diversity and a wide scope of personalization are core benefits even of the standard TECHART interior options which ensure quick and easy retrofitting. Such as the personalized TECHART door entry guards, TECHART multi-function sport steering wheels with paddle shifters, aluminium-made sport pedals, contrasted decorative stitching, color-coordinated instrument dials, trims and surfaces in lacquered finish or made of carbon fiber or any upholstery and refinement made of select leather. TECHART presents the new individualization options for the Porsche 911 Carrera GTS and the 911 Carrera 4 GTS models in a world-premiere in early March at the Geneva International Motor Show.